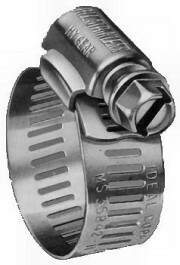 "Industry standard, versatile Hy-Gear clamps have a wide range of applications. From simple home and auto repair to heavy duty industrial uses. " Marine grade clamp for boating applications and other corrosive environments. High nickel alloy stainless steel meets the demands of inground and marine use.